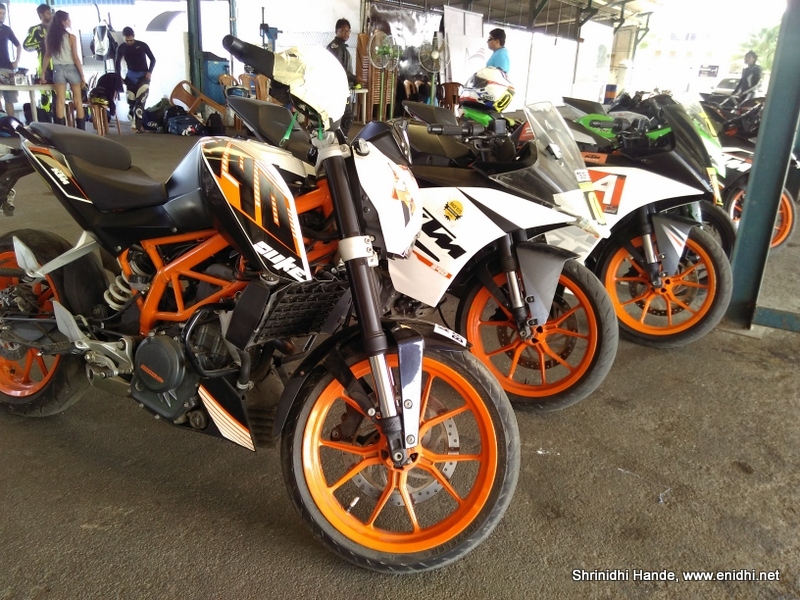 Last Saturday, I spent couple of hours in MMSC Chennai during an event called Motovation Track Days. One, I don’t have a high-end bike powerful enough for racing. My Apache RTR160 is good enough compared to other 100cc kids on the road, but it is not a match to power and torque of a KTM or Ninja and such premium super sports bikes. While I was told that Apache is good enough to participate, I felt that I ran a risk of looking like a street cricketer trying to play with international players. Two: Racing is a serious and expensive hobby. 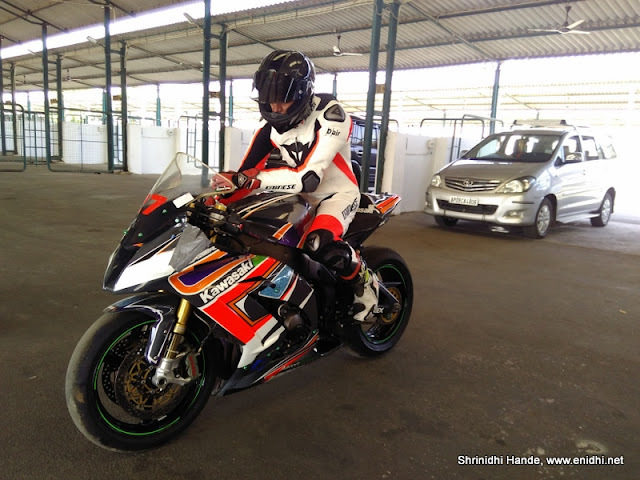 I wasn’t 100% sure if I want to try this-I am fine with occasional long rides, superbike rentals and stuff like that, but should I try high speed racing? I felt I wasn’t sure. Serious racers spend lots of money on their passion- many participants had shipped their bikes from other cities, had come in their cars full of accessories and support materials. 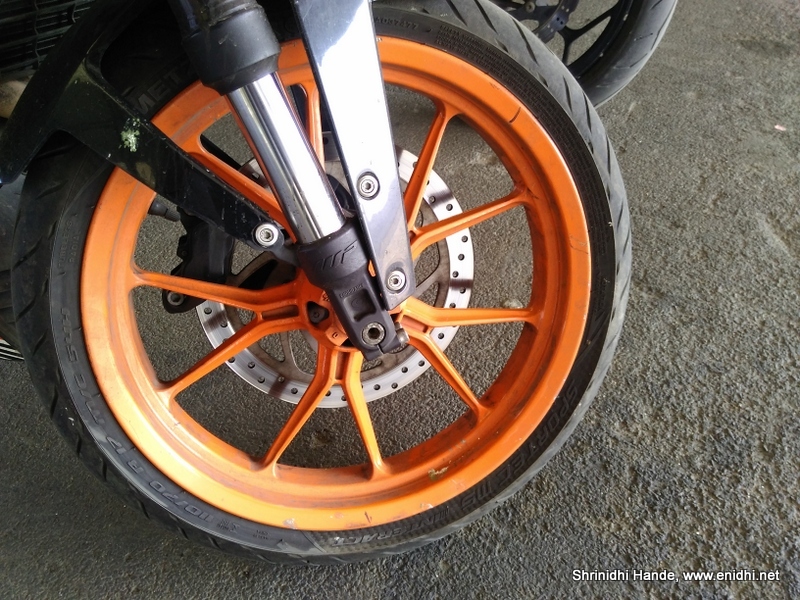 Most bikes were modified to get rid of unwanted accessories that increase drag (such as mirrors), a set of full body protective gear (helmet, padded jackets, knee pads, rugged shoes and so on) can cost as much as a 100cc bike. With all these investments, returns will be low if one is not serious about it or doesn’t race/practice regularly. Like all other serious passions, one day is not enough to master it- continuous practice is required. Practicing on public roads can be deadly and racetracks cost lots of money to access. Many bikers were readying their bikes for the session. 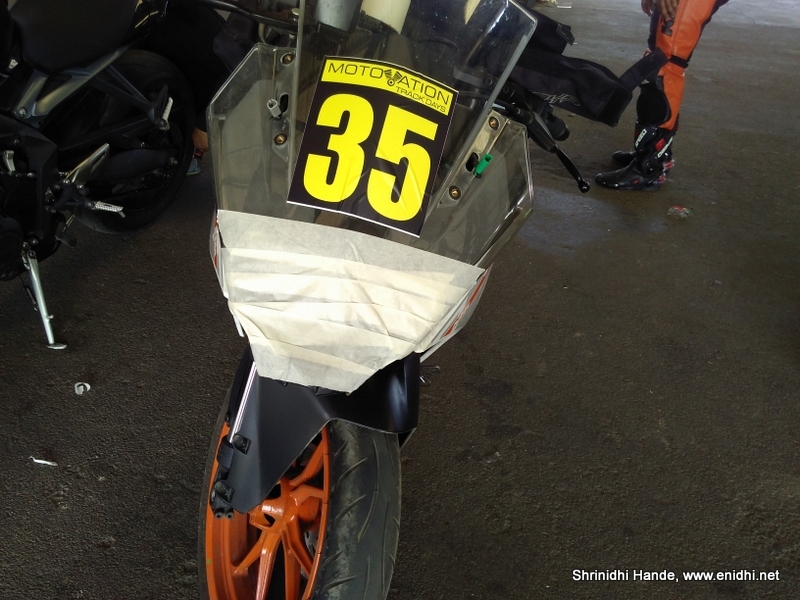 The tail lamp and headlamps were covered with tape, to prevent glass from shattering on the race-track, which can be deadly for other bikers whose wheels may run over the glass pieces at high speed causing damage to tyres and track alike. Professional Bike Racer Sandesh Prasanna Kumar (Sandy) was one of the instructors. 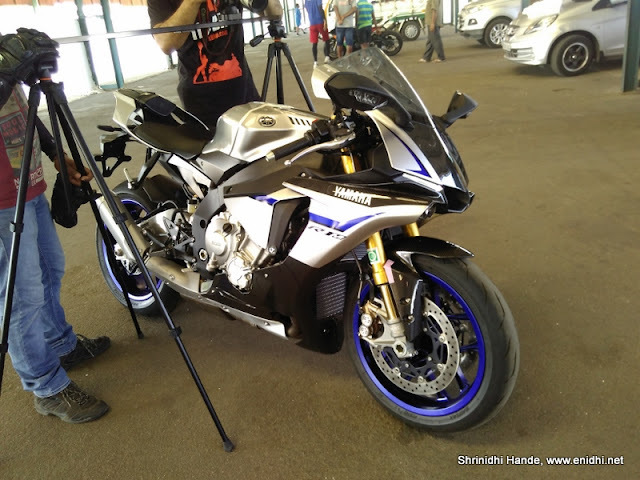 Priyanka Kochhar, a popular lady biker from Mumbai was there too. I was thinking there will be a class room session before they hit the track, but there wasn’t one. Organizers took a familiarization lap, felt that maintaining stability will be risky at normal tyre pressures and advised bikers to drop the pressure (approx. 20 and 22 PSI front and rear). Participants were split into two groups and went on to hit the track, led by Sandy. I did a mistake of not checking the memory card slot in the camera, so ended up there without a memory card, so had to rely on GoPro and mobile for some pics. Should be careful in future. Sitting in the pit stop I wasn’t going to learn anything about racing. Could have stood next to the track at a corner and click some pics, but the soaring temperature wouldn’t permit that for long. 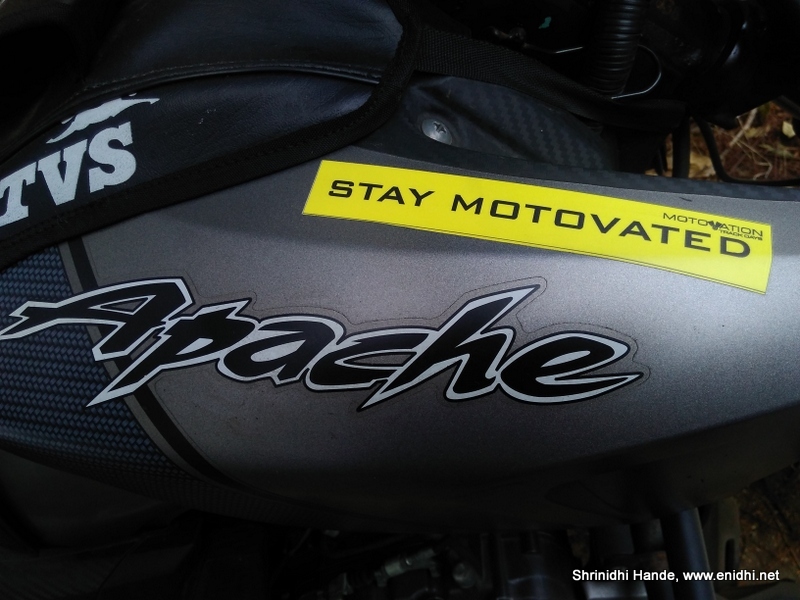 Eventually I left the venue, not before picking up couple of stickers for my bike, with permission. MMSC rentals cost about a lakh per day if you want to use the venue. For serious bikers, events like Motovation Track Days (MTD) is a good opportunity to put their machines to test, learn tips from professionals as to how to save a few seconds at every corner and how to ride faster and safer. Amateurs, enthusiasts and even seasoned veterans can join the sessions to learn more and improve their riding skills. Check Motovation Track Days website for details. Motovation Track Days is NOT a Race. All part of the track is monitored and those who overspeed or violate safety instructions run the risk of getting kicked out. Though I left early, I could see that everyone else had great time on the track, going by the pictures at their facebook group. Check it out if bike racing is something you would like to explore.